^ "Whitewater Controversy House Floor, Jul 29 1994 | Video | C-SPAN.org". www.c-span.org. Retrieved 2019-01-22. ^ Manchester, Julia. "Jewish GOP group calls on Dem lawmakers to resign over Farrakhan remarks". The Hill. Capitol Hill Publishing. Retrieved 17 April 2018. ^ Lima, Cristiano. "Dems denounce Farrakhan rhetoric amid pressure from GOP". Politico. Capitol News Company. Retrieved 17 April 2018. ^ Kennedy, Merrit (24 October 2018). "Apparent 'Pipe Bombs' Mailed To Clinton, Obama And CNN". NPR. Retrieved 25 October 2018. ^ ""Potentially destructive devices" sent to Clinton, Obama, CNN prompt massive response". CBS News. 24 October 2018. Retrieved 25 October 2018. ^ Allen, Jonathan (August 8, 2011). "Waters to Obama: Iowans or blacks?". Politico. Retrieved 23 October 2018. ^ Williams, Joseph (August 29, 2011). "Obama reopens rift with black critics". Politico. Retrieved 23 October 2018. ^ Ruiz, Joe. "Trump again questions Rep. 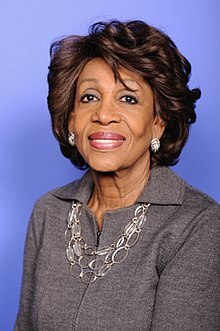 Waters' intelligence, says she's 'very low IQ'". CNN. Retrieved 2018-03-11. ^ Epstein, Jennifer (Aug 22, 2011). "Rep. Maxine Waters: Tea party can go to hell". Politico.